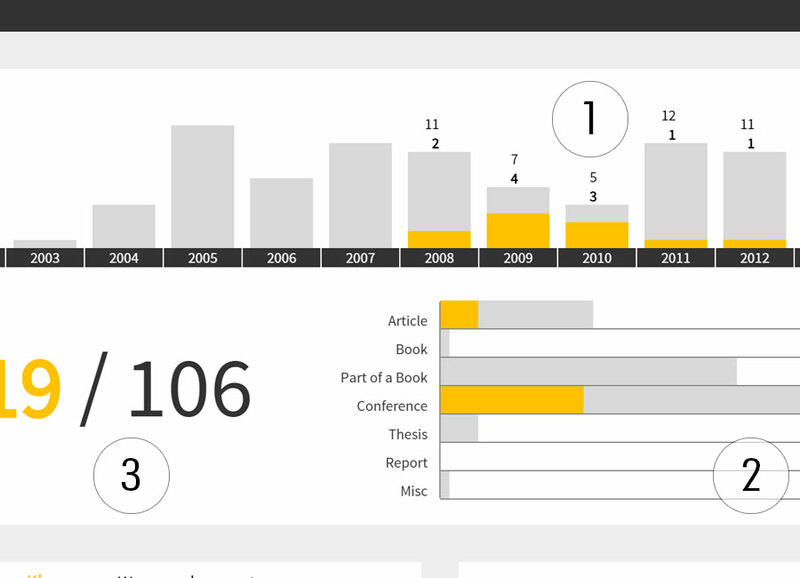 PubViz is a tool for interactive visualization of publication data. Usually, publications are presented in textual form with some sorting and searching capabilities. The aim of PubViz is to display structured publication data using a set of interactive visual representations working together. 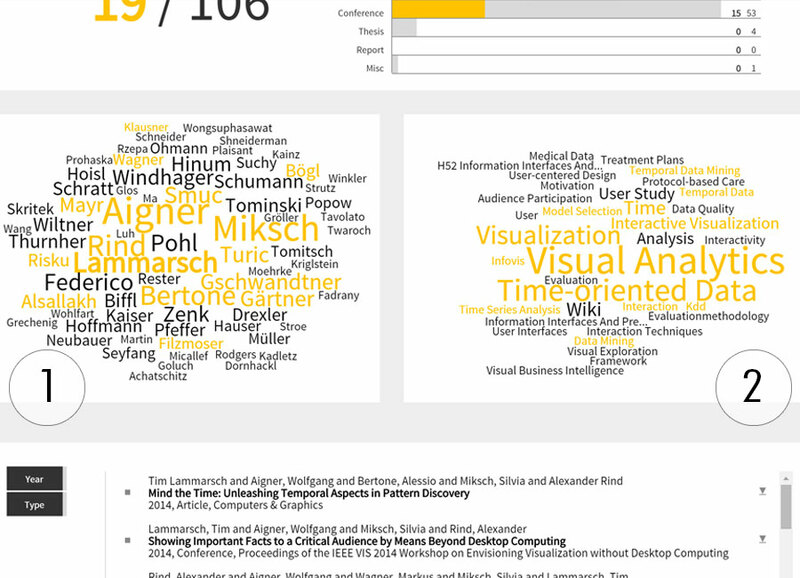 PubViz shows amounts of publications along a timeline, uses bar charts for different publication types, wordclouds to show co-authors as well as keywords, and finally a groupable list view. Allowing for interactive exploration with complex query funcionalities that are easily accessible are the main aims of this tool. PubViz provides powerful query functionality while using intuitive representations that are easy to grasp and add to a playful user experience. As the name suggests the top part was designed to provide an overview of the publication database. It consits of three elements: (1) a chronological bar chart, which lists the amount of published works per year, (2) a horizontal bar chart, which shows the quantity of published works by type of publication in detail, and finally (3) a simple textual overview of the filtered results to the total number of publications. Each year and publication type can be clicked to filter the publications. There are two wordclouds: (1) the wordcloud on the left contains authors and co-authors and (2) the wordcloud on the right shows recorded keywords of all publications in the database. The size of the words depends on how many times an author respectively a keyword appears in the database. Words are bigger if they occur more often. Each name or keyword is interactive and can be clicked to filter the publications. 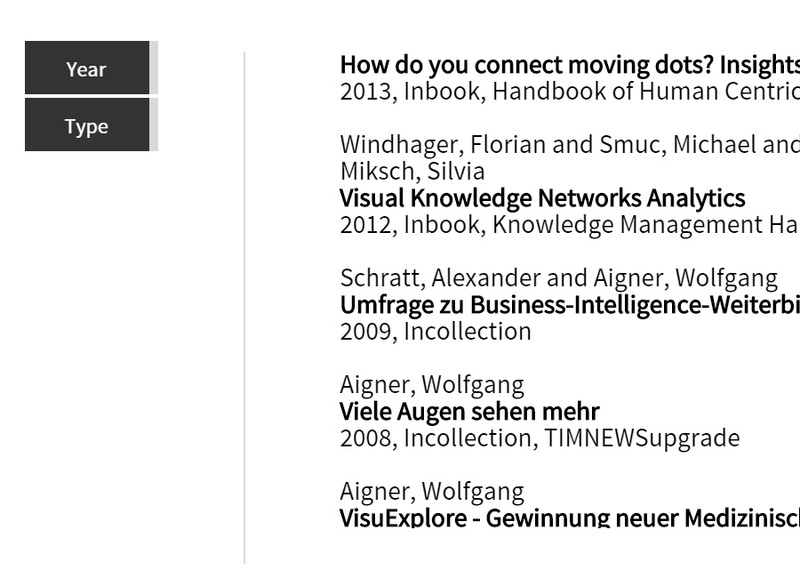 The list view shows all details of the publications in a textual list. Individual items in the list can be expanded when clicking on them to reveal further publication details such as page numbers, publishers, or the publication’s abstract. Furthermore, the PDFs of the publications are made available via a download icon on the right. Initially, the list of publications is shown according to the default order in the provided data source. If publications are filtered in the other views, the list only shows the results according to the user selection(s). The list can also be grouped and sorted by publication year and type. The three views are tightly coordinated and change according to what has been clicked on. Entries that specify the query are shown in boldface and the results of a query are shown in color. A filter can be reset by clicking on an empty area or using the button on the top right. An example: The user is searching for all publications published in the year 2003. By clicking on the bar for 2003 in the timeline, the other views change immediately to highlight the publications of 2003. The list shows only the publications of 2003, colored bars show up representing the number of the different literature types, the respective authors are marked and keywords are colored. You can embed PubViz for free on your website! It uses BibTeX as source data format, which can be exported by all major reference management applications. PubViz can be integrated into your own website easily: no installation procedure is required - just download the package on GitHub, edit the HTML template, upload it together with your .bib file to a webserver, and you are done. For details see the LICENSE file. give us suggestions or to just say hello!